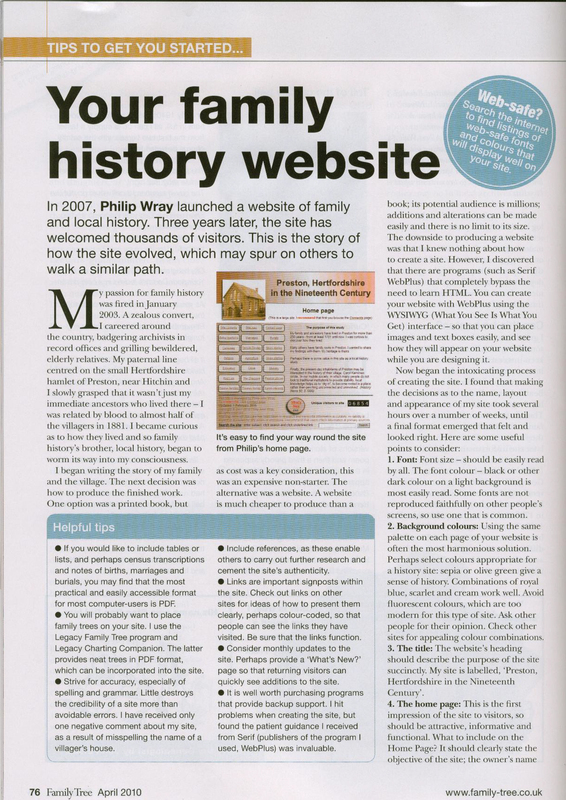 When the article was submitted, it was intended to explain the evolution of the Preston web-site from family history to local history. The editor slashed her blue pencil over the first paragraphs which are now included below. They may be of interest as they explain how the web-site was conceived and grew. 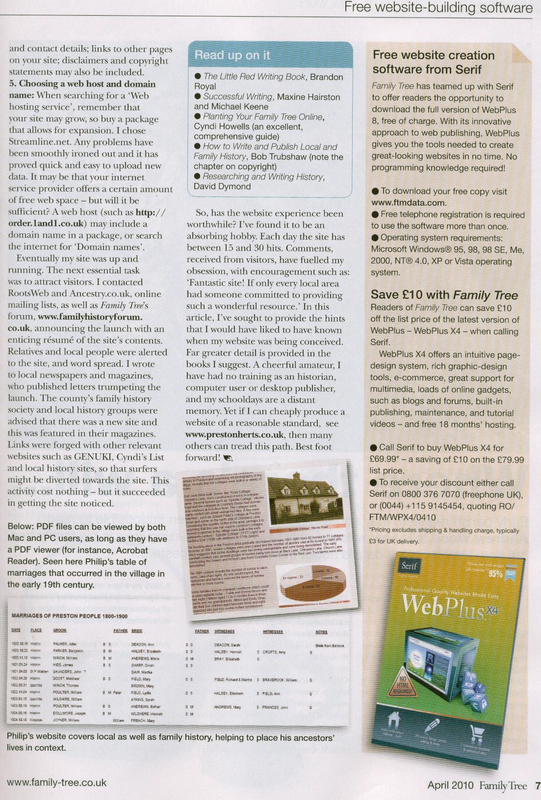 The April 2010 issue of the flagship genealogical periodical, Family Tree Magazine, carried an article featuring the Preston History web-site. In August, 2007, I launched a web-site of family/local history that focused on the Hertfordshire village of Preston, near Hitchin. Twenty-one months later, the site has welcomed more than 4,689 visitors. This is the story of how the site evolved - which may inform and spur on others to walk a similar path. My passion for family history was fired in January 2003. A zealous convert, I careered around the country, badgering archivists in Record Offices and grilling bewildered, elderly relatives. I also bought my first computer and struggled with its intricacies. After three years, I had reached the stage when I wanted to record the fruits of my research – a purely personal exercise, ‘for my eyes only’. I studied desktop publishing and photo-enhancement and invested in Serif’s budget programs: PagePlus and PhotoPlus. The results were printed and comb-bound in two, forty-six-page books. I slowly grasped that it wasn’t just my immediate ancestors who were part of the village: I was related by blood to almost half of the locals in 1881. I became intrigued by the life all my people had led in rural Hertfordshire and researched the lot of the agricultural labourer and the straw plaiter. 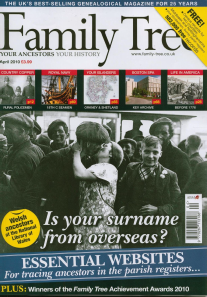 In this way, family history’s bigger brother, local history, began to worm its way into my consciousness. During a visit to Preston I was introduced to an academic who, having an interest the history of the village, offered to read and comment on what I had written. When the manuscript was returned it had been savaged - in the nicest possible way! Every schoolboy error of grammar and punctuation was exposed, my fine ideas of presentation, gently repulsed: ‘...rather odd and curious...best omitted’. This experience was a cold shower of reality. I realised that I must re-think my approach: should I write for a wider audience or continue in a strictly private style. I was at the crossroads where family history becomes part of the far wider field of local history. I took the ‘local history’ route and the re-write began. I pored over books explaining grammar and writing style and tried to polish my prose.  Gradually, Mark II of my opus took shape. The next decision was how to produce the finished work – was a printed book viable? When evaluating my options, a key consideration was cost. A self-financed print run was an expensive non-starter and to produce one home-made book cost around £30 in ink and materials. A further drawback was the inflexibility of the printed page – corrections and updates required a re-print. The issue of copyright also raised its ugly, ill-defined head as contributors seemed un-inclined to give permission for their photographs to be used on the printed page. The alternative was to compile a web-site. These were the advantages: a web-site is much cheaper to produce than books; its potential audience is millions; additions and alterations can be made easily as a site is not set in stone; there is no limit to its size. The down-side to producing a web-site was that I knew nothing about how to create a site and HTML code was Greek to me. But, having already grappled with Serif’s family of products, I discovered that their WebPlus program not only had a similar interface as their other products (which made it easier to learn) but also completely bypassed the need to learn HTML.